You work hard all day and you need the right tools to get the job done! 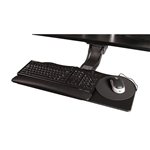 An ergonomic platform is a critical component of your work space comfort and safety. Ergonomic Accessories has the perfect combo solution to suit your every need, whether it is one of our many popular combo options or your very own creation. 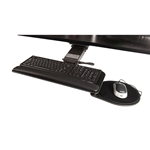 With our patented designs, trays and mousing options, it is easy to assemble a keyboarding system that offers maximum flexibility and a personalized ergonomic fit. Your approach to product selection may extend beyond a single solution, so we have taken the guess work out of choosing your perfect combination by using the products that work best together and packaging them for your convenience. You may also decide to choose from one of our many other keyboard arms and keyboard tray options and create-a-combo of your very own.